This recipe is adapted from both Ina Garten (in Barefoot Contessa Family Style) and Mark Bittman. Serve with asparagus, green beans, or other quick-cooking green vegetables, or a raw kale salad. Peel the garlic cloves and put them in a food processor. Add the butter, rosemary, sage, salt, and pepper. Process into a thick paste. (If you don't have a food processor, just mince everything together except for the butter, then stir the butter in with a fork.) Smear the lamb all over with the paste, then place on a roasting rack (or just in a large, sturdy baking dish). If you have the time, let the roast sit at room temperature for 30 minutes to an hour. Preheat the oven to 425 degrees. Toss the potatoes and carrots in a bowl with the olive oil. Roast the lamb at 425 degrees for 30 minutes. Turn the roast over and add the vegetables to the roasting pan, then turn the heat down to 400 degrees. After 20 minutes, turn the vegetables; after another 20 minutes, check the vegetables to see if they're done. If done, remove to a warm bowl and keep warm. The lamb should take a total of 1 to 1½ hours to cook; when you check the vegetables a second time, insert an instant-read thermometer into the lamb. For medium-rare lamb, the thermometer should read 130 degrees; for medium, 140 degrees. When the thermometer reaches the desired temperature, remove the lamb from the oven and let it rest for about 20 minutes. 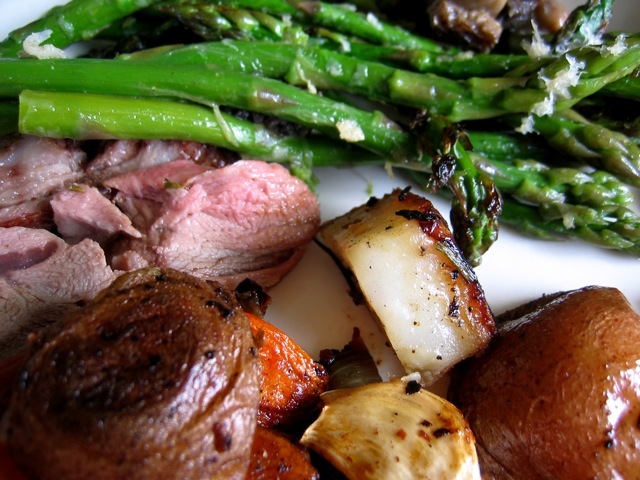 While the lamb is resting, steam or pan-fry the asparagus, green beans, or whatever green vegetable or salad you plan on serving alongside the roast. Carve the lamb into slices and serve with the vegetables. Ask your butcher to make up a boneless lamb roast for you; you just have to specify leg or shoulder (they're similar) and the total weight, and wait for the butcher to put the roast together. The roast should be 3 to 4 pounds total.